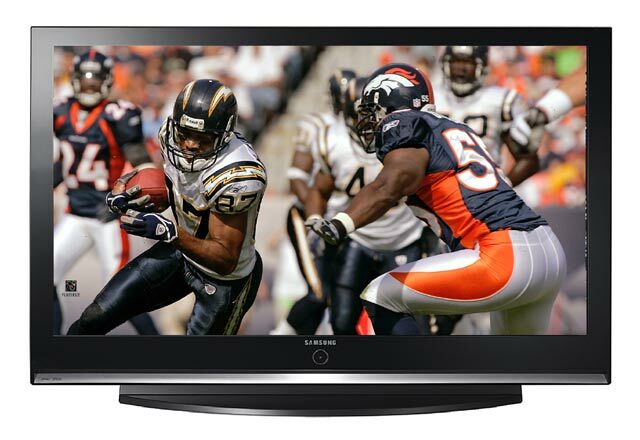 Samsung has its fingers in all kinds of TV technology pies, and although it's better known as a purveyor of DLP- and LCD-based HDTVs, the company still sells a tremendous number of plasmas. The HP-S5053 is the company's entry-level 50-inch flat-panel plasma, and if recent trends are any indication, it may prove just as popular--if not more so--than its 42-inch brother, the Samsung HP-S4253. This 50-inch plasma is priced to compete with models such as the Panasonic TH-50PX60U, costs a few hundred bucks more than sets such as the LG 50PC3D and significantly more than the Vizio P50HDM, putting it into somewhat of a middle ground price-wise. The Samsung HP-S5053's look can definitely turn heads when turned off, and its comprehensive collection of inputs will appeal to folks with lots of gear, but its image quality, despite delivering excellent black levels, isn't quite up to the state of the plasma art. That said, if you tend to watch your movies with the lights on or you sit far enough back to overlook a few artifacts, you'll probably have few complaints. We liked many aspects of the Samsung HP-S5053's image quality, including its excellent black levels and accurate color decoding, but its tendency to introduce too much noise and false contouring into many scenes was difficult to overlook. One of the most impressive characteristics of the HP-S5053's picture is the depth of black it can achieve. We saw evidence of this when watching The Bourne Supremacy HD-DVD from our Toshiba HA-A1. When Jason Bourne (Matt Damon) walks out onto his Goa rooftop at night, the shadows in the distance, the night sky, and the letterbox bars all looked as inky as we've seen on any plasma, and deeper than on any other kind of non-CRT-based television we've reviewed in a long time. These artifacts are species of false contouring that also plagued Samsung's 42-inch model, and they were difficult to escape in scenes such as this. As with the 42-inch model, when we reduced the brightness control to lower the amount of noise, we started losing detail in shadows. Flat fields of near darkness, such as the wide shot of Bourne's house in the early dawn, also brought out crawling greenish motes of noise. As with all similar artifacts, the noise and false contouring became less visible when we moved farther back than our normal 8-foot seating distance; at 10 feet, for example, the motes were much more difficult to discern. With test patterns, we noticed that gray areas fluctuated significantly from one step of brightness to another. We did calibrate the grayscale to bring it a bit closer overall to the standard, but that had little effect on the Samsung's comparatively poor grayscale tracking. Details were fine for a plasma of this resolution, and when Marie looks through Bourne's papers and maps, we could easily read the writing and see the tiny type. As usual we recommend you feed this plasma the high-def resolution that's closest to its 1,366x768 native resolution: 720p. 1080i sources looked slightly softer, although the difference was again quite subtle. By the same token, it likes HDMI better than component-video, which evinced high-frequency interference in the most-detailed areas of test patterns, although yet again, it was difficult to spot in normal program material. As a side note, like a few HDTVs out there, the HP-S5063 can't handle 480i sources via its HDMI input, but that's not a big issue since HDMI is usually reserved for higher resolutions anyway. We also noted in the review of the 42-inch HP-S4253 that it was impossible to completely eliminate edge enhancement, but its 50-inch brother didn't suffer the same issue. Standard-def performance was a bit problematic according to our test patterns, and in particular, composite-video appeared way below average, with strange vibrations and instabilities in lines that should be stationary. We recommend you use a progressive-scan or upconverting DVD player with this set to avoid this kind of instability. Details via component, S-Video, and composite video appeared softer than they should have, although the set did do a very good job of smoothing jagged lines and engaging 2:3 pull-down detection quickly. We looked at some noisy standard-def video and found that the HP-S5053 did an average job of quelling the snowy-looking motes. Unfortunately, engaging its noise-reduction circuit had very little effect for reducing the noise from any source. Finally, we tried to assess Samsung's claim that the HP-S5053's glass panel reflects less room light than other plasmas, but it was difficult to do so without other plasmas onhand. Anecdotally, Samsung's screen did seem to reduce glare a little, although in our testing room we still noticed overhead lighting, for example, reflecting off its surface. Of course, glare is an issue with all plasmas and direct-view CRTs but doesn't plague flat-panel LCDs or microdisplays.